We have been busy behind the scenes of late preparing for our own celebrations- ahead of the Hospice’s 20th anniversary this year, we’re marking the occasion with an invitation to the trip of a lifetime! As you trek along this iconic Wonder of the World, you’ll cross ancient watchtowers and battlement stations to witness magnificent panoramas of luscious, rolling green hills as far as the eye can see! 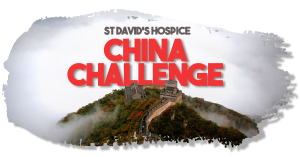 wall, a unique exclusive to Global Adventure Challenges, whilst immersing ourselves in stunning scenery and Chinese culture. ancient and modern meet, on a free day so why not visit iconic landmarks such as the Forbidden City, Temple of Heaven and the famous Tiananmen Square to name a few! Dragon Boat Challenge 2019 →← Jolly Jumpers Campaign 2018!